The outbound market for Mice* and luxury travel from the GCC region is witnessing changing trends for destination preferences according to key Mice and luxury travel specialists attending the upcoming fifth Annual Mice Arabia and Luxury Travel Congress. “For Mice, unique destinations that are connected well in aviation routes, food requirements as well as destination safety and security play a big part in the considerations of buyers/planners not to forget the relative costs of the destination. Required Mice facilities as well as unique local experiences are also a priority for these planners and buyers.” said Jason Lim, chief operating officer – DMC, Smailing Tours & Travel Service, Indonesia. “The strong currency in most of the GCC countries, which enables exchange benefits makes for more attractive travel deals to Indonesia.” Lim also drew attention to the expatriate population in the GCC countries, who according to him have “contributed to the steady growth of outbound travel from the GCC countries,” he further added. The period from June to September is the main travel season. During these months, which coincide with school holidays and extreme summer heat, outbound travel is high. Exotic getaways are not always tropical or beach-based, and travellers from the GCC region do seek out different and natural weather phenomena. “Scandinavia is as exotic to the GCC client as the GCC countries are to us. In contrast to the hot summers in the GCC countries, we offer cool, blue majestic fjord waters and midnight sun—this change of climate can be very attractive,”said Dag Kastensson, CEO, SNE Northern Europe, a Swedish destination management company. Availability of Halal food and beverages, and cultural familiarity ranks high among GCC traveller, according to some sponsors. “Montenegro is a Mediterranean destination presenting GCC travellers with some form of familiarity,” said Borislav Jablan, head of Business, 3e travel d.o.o. – DMC, Montenegro. “Beside this familiarity, hospitality services in Montenegro are showing progress in terms of high quality standards, necessary for authentic luxury travel experience,” he continued. Most sponsors recognise the requirement for and importance of Halal food and beverages and are concentrating on delivering the necessities. The sponsors also agreed that the availability of hassle-free visa processes is extremely important for drawing travellers from the GCC region. 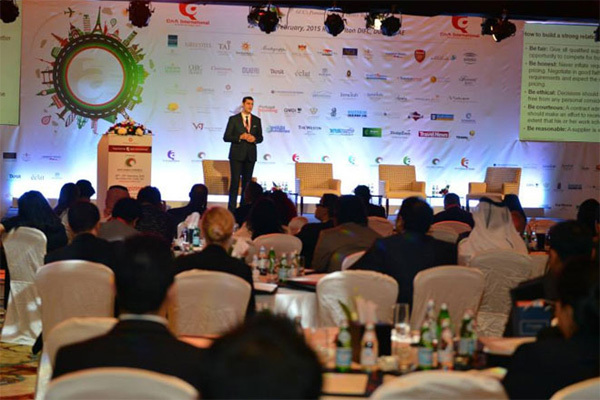 “Platforms such as the Mice Arabia and Luxury Travel Congress, offer individuals representing country tourist bureaus and boards, and private tourism and hospitality institutions, a chance to understand the requirements of the GCC Mice and Luxury traveller. It is easy to assume that Halal food is the number one priority, but security, convenience and exciting experiences are all important too. Further, the intricacies of these requirements are what will set the destinations, or the hospitality operators apart from the competition. We are glad to be offering this important platform curated in a five star environment to do business,” commented. Sidh N.C, Director, QnA International- -organisers of the congress. * The MICE market refers to a specialized niche of group tourism dedicated to planning, booking and facilitating conferences, seminars, and other events.